Familiar with installing concrete on a large scale, Cory Sumner, owner of Accurate Concrete Works, in Houston, Texas wanted to expand his horizons utilizing his experience with concrete. 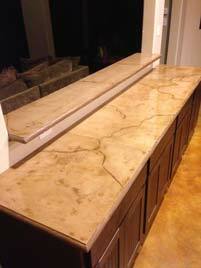 This led him to look into the Xtreme Series System from SureCrete Design Products and how to make custom concrete countertops. Cory was instantly impressed with the Xtreme Series products and, after training, was confident enough to tackle his first job: 252 square feet of kitchen countertops. His process started with making a template for each section of countertop. Admittedly, Cory found this to be the trickiest part of the process on his first job (now…not so much). He quickly discovered that using balsa wood strips was the way to go. With the completed templates he was ready to make his concrete countertop forms atop quality melamine. Again, this was another learning experience. After messing with taping foam rails down and finding it awkward, he tried shooting nails into the foam rails to secure them. This worked and has become his preferred method. As a bonus he can reuse the foam rails. His client wanted lighter colored concrete countertops with dark veining and a 1-½ inch profile. Xtreme Series Precast was the best choice for this project. With this product he was able to keep the profile height but make the countertops only ¾ inch thick, thus reducing the weight significantly without sacrificing the strength of the finished concrete countertops. He blended Sun Buff colored Integral Color into the precast and poured it into the mold stopping and starting accordingly, distributing Chocolate colored Integral Color, where he wanted veining. 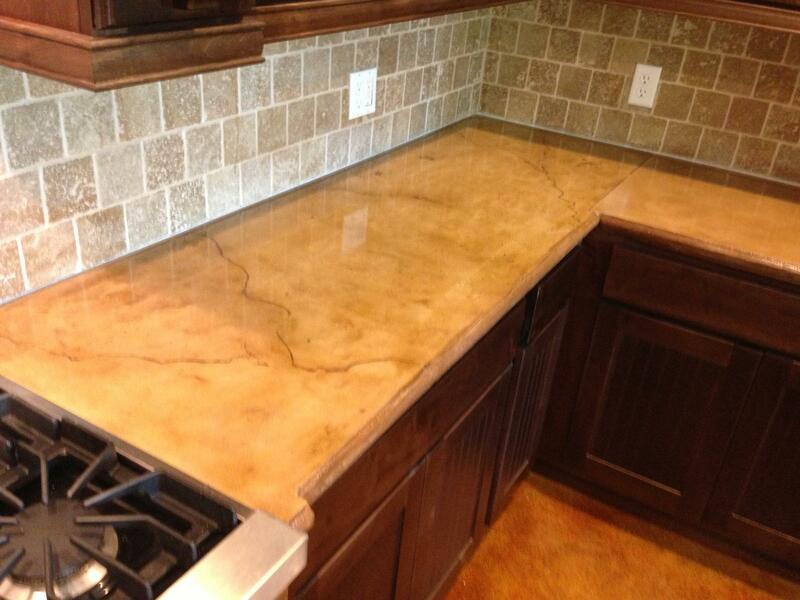 Once de-molded Kayak Eco-stain was applied to add contrast to the concrete countertop. It was sealed with highly durable, color enhancing and high shine XS-PC12 Hybrid Solvent Based Polyurea. Cory is pleased with the success of all his concrete countertop projects using SureCrete’s Xtreme Series products and has shared his new found skill with others who have, likewise, enjoyed success with their projects.